It’s a stampede. Some of the sheep are virtually running out of the frame in response to being herded by the shepherd’s dog. Their facial expressions run from goofy to indignant to confused. The shepherd waits in the background as the dog follows his command to keep the sheep off the rocks and turn them back to the barn. 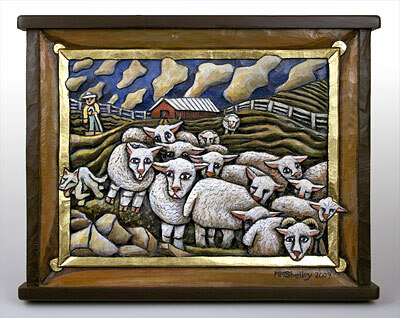 This is an action packed scene, with the shepherd, the sheep and the dog all leaning in different directions. Mary Michael Shelley's artwork is made by old fashioned mallet and chisel, then painted with acrylic paints. A gold leaf inner frame serves to accentuate the shapes of objects carved into it and completes the look of the piece.